Aataullah is the first ever winner of the Future CFO of the Year Award with ACCA! He wasn't really that bothered about it to begin with and never dreamed he'd get as far as he did! Initially, when it came to the application I was not fussed as much as you would expect. Not due to apathy, but because of revision! I wrote out my application form nonetheless as best as I could while juggling revision for exams. Continuing my revision, I could only hope for the best. Then, one afternoon as I was getting home from the library, I received a call from TARGETjobs about completing the online tests and the lovely lady on the line (who I would like to thank very much! ), told me looking at my application she believed I was a real contender to win the Future CFO of the Year Award. This really helped motivate me to get as far as I could in the competition. I gave my utter best during each online test, and a short few weeks later I received an email from ACCA Global inviting me to an assessment centre. I was excited to have got so far already! The assessment centre at ACCA Global was a brilliant experience that helped me develop in many ways. Some of the tasks were truly difficult, but I believe completing them helped me develop skills such as communicating, problem solving, and presenting, in ways that I have never been able to throughout my degree. I met many amazing people at the assessment centre who each in my opinion were worthy of the award. As a result, I had doubts of becoming a finalist after witnessing how well each shortlisted candidate did. When it came to finding out I was a finalist I was truly astounded: I felt that everyone did so well at the assessment centre and it would be impossible to get this far! Nonetheless, I was excited for being a step closer to potentially winning an Undergraduate of the Year Award! I was excited to visit Canary Wharf and the venue for the awards was just superb. I had a great time speaking to my fellow finalists and the people at ACCA Global. At the time, despite if I won or not, I already felt having come this far was an excellent achievement and everything I had experienced would help me in the future, especially when it came to applying for jobs. As Fiona was calling out the finalists and winners, I was unsure of what to think about my category. As it grew closer and closer, I was becoming more nervous but my mind was completely blank! Once my name was called out I was in complete shock: I was never expecting that I would win! It was a fantastic feeling and being presented the award by Helen Brand, chief executive at ACCA Global, and Fiona Bruce was the cherry on top! 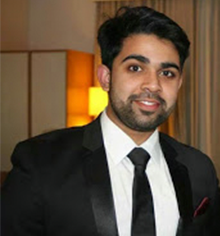 Find out what Aataullah has been up to since winning the Future CFO Undergraduate of the Year Award! I can truly say that winning Undergraduate of the Year has had a huge impact on me over the past few months. I’ve not had much of a break over the summer but I suppose it is worth it in the long run! Alongside my trip to Shanghai, I also interned at Grant Thornton and TalkTalk, the second being the internship I won with the award. Both internships were brilliant at exposing me to the world of finance. Coming from a mathematics background, it has been an excellent opportunity to discover finance in practice and also in industry. At Grant Thornton, I spent four weeks in the audit division. I learned about how the process takes place and I was able to look into different stages of the audit for a number of clients. However, I spent most of my four weeks at a larger client, and was able to see the transition from the middle of the audit to nearing to completion. This was a great opportunity as it meant that my work was varied, and I was able to gain more exposure. Also, spending most of my time at a single client gave me a glimpse into the real life of an auditor. I worked with a great team of people who were always willing to help despite my lack of financial knowledge! I won the internship with TalkTalk through ACCA, and I was very excited to work at such a large company. I did not know much about telecommunications, but working at TalkTalk has shown me that it is an interesting and lively industry. I was looking forward to it from the beginning as it would be an insight into the other side of finance, being in industry. I was lucky enough to gain an insight into different parts of the company through finance: the main two departments being overheads and accounts payable. I enjoyed the internship very much as I was able to find out all the work that goes into producing financial statements. I never had much exposure to financial statements before this summer, but the internships have really helped me discover how to not only understand them but also the information about the company you can gain from them! Also, my internship timed with their half-year end, and I was able to take part in several meetings with the managers and finance controllers, which was really interesting as it gave me a flavour of the transition from finance to business, and how financial information can be used to make business decisions. As I mentioned before, ACCA had kindly presented a trip to Shanghai as part of the award. This was a fabulous opportunity where I met with many financial leaders including CFOs! I was given the opportunity to shadow a CFO at Starwood Hotels Group, one of the largest hotel groups in China, and I learned more about the CFO role itself. I also had the opportunity to meet Grant Thornton in China, which was amazing having already worked at the company in the UK. Speaking to several partners, I learned about business strategies that were being implemented and I was pleased to see that the same values and ambitions in the UK were being resonated in China! Speaking to the CFOs, I discovered the transition between being an accountant and being able to manage and lead the finance department, and the skills that are required to ensure the success of your career and the organisation. I learned how the ACCA qualification helps one achieve such a transition. Whether it’s here in the UK or in Shanghai, the qualification is looked upon highly, and it is throughout the world. It lets others know that you have the technical knowledge needed for a business to operate successfully. The trip really opened my eyes to the recognition for such a qualification; I hope to one day become a qualified accountant myself! The award has really opened up a lot of doors since I won in April. I’ve been able to expand my network internationally and I discovered more about China – a country I never imagined I would travel to anytime soon! Since ACCA and TARGETjobs are so well recognised, winning the award has really boosted my CV. Being able to take part in internships over the summer has also boosted my CV, but it has also helped me discover new skills that I may not have throughout my academic life. Being able to gain an insight into finance in both practice and industry has confirmed my ambitions to work in finance. The award has helped me decide where I would like my career to take me, and I do hope that I can one day become a CFO! If there is even a small part of you that believes you can become an Undergraduate of the Year I would insist you apply. Not only is it amazing recognition, but you will get to take part in so many things that could have a lasting impact on your future. I never imagined I would be winning an award when I applied, but I also never imagined the opportunities that would come my way having done so. It has been a fantastic half year since I won, and I only hope the opportunities to learn and develop more keep coming my way! Management consulting associate at PwC.